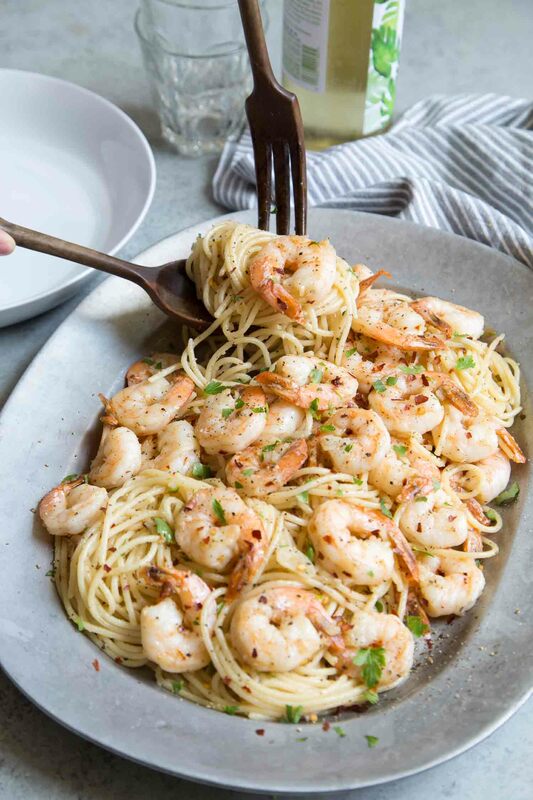 With this super quick and easy Spicy Garlic Shrimp Spaghetti recipe, you can have dinner on the table in less than 20 minutes! This recipe simply requires one pot and a handful of ingredients. After a long day of work and errands, the last thing anyone wants to do is cook dinner (and wash the resulting dishes ). This is the dish to make on those nights! They’re all the same. Most “fresh” shrimp sold at markets (even the fancy ones!) have been frozen and thawed. Frozen shrimp is perfectly fine. Defrost it overnight in the fridge and use within 2 days. Small, large, jumbo, or colossal? Those sizes vary per brand and vendor. The best way to gauge shrimp size is by it’s “Count per Pound” or “U” listed on the packages. (“U” stands for under. Super giant shrimp will be labeled U/12- meaning under 12 pieces per pound.) These numbers are generally used for shrimps without heads. For this recipe, I used large shrimp (listed as 26/30) or 26-30 pieces per pound. Just remember- the smaller the number per pound, the bigger the size of shrimp. When cooking shrimp for a longer period of time, like stews or a seafood boil, it’s best to use unpeeled shrimp to get the most flavor. However, for fast weeknight cooking, I like to use shelled shrimp. Bonus points if the shelled shrimp has also been deveined. Raw shrimp will be translucent, grey, and flimsy. Once introduced to heat (or acids in the case of ceviche), the cooked shrimp will quickly turn pink and curl into an O. Be careful not to overcook shrimp. No one wants to eat tough, rubbery shrimp. When a dish claims to have garlic, I expect a ton of garlic flavor. 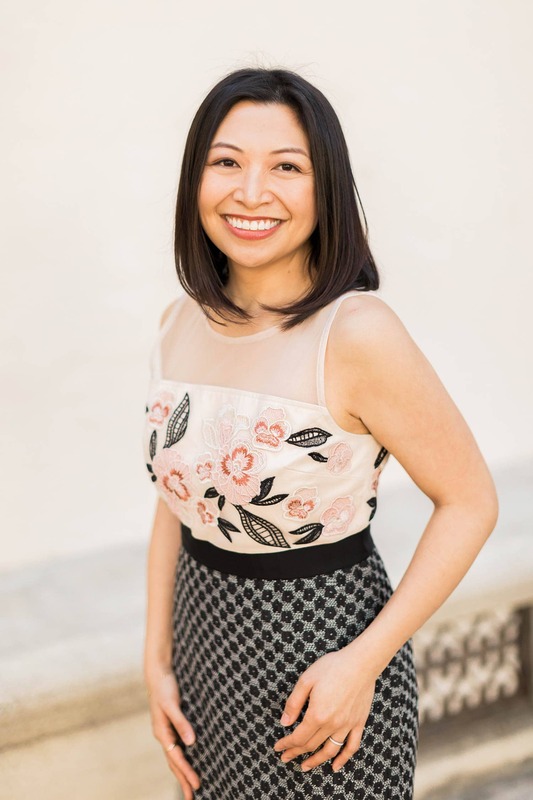 (I’m Filipino-American. Much of Filipino cuisine is very garlic heavy!) This recipe uses 10 garlic cloves. That may seem like a lot, but I find it to be the perfect amount. I like to use the garlic two ways. Some of the garlic is thinly sliced, while the rest is minced using this handy-dandy garlic press. This provides more texture and variety. I use a combination of olive oil and unsalted butter for the base of the sauce. Once the fat is hot, add the red pepper flakes to allow the liquids to absorb that spice. Then add the sliced garlic and minced garlic. Within 30-45 seconds, you should start to smell the aroma of garlic. 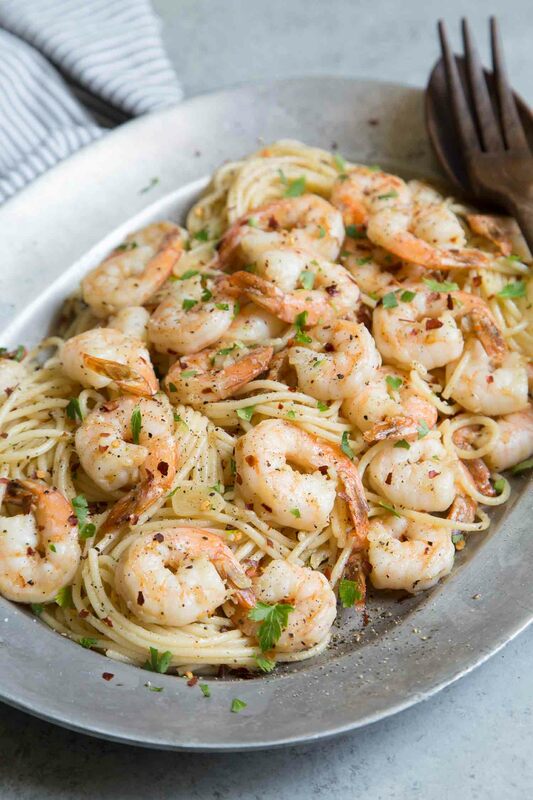 Before the garlic starts to brown, add in the shrimp. It takes about 4 minutes to cook the shrimp (about 2 minutes on each side until the shrimp is pink). Remove the pan from heat. Toss in the cooked pasta, a tablespoon or so of pasta water, and additional seasonings. That’s it. Grab a chilled glass of white wine and enjoy! Cook spaghetti according to package ingredients. Before draining pasta, save about 1/2 cup of cooking pasta water. Set aside. Pat shrimp dry. 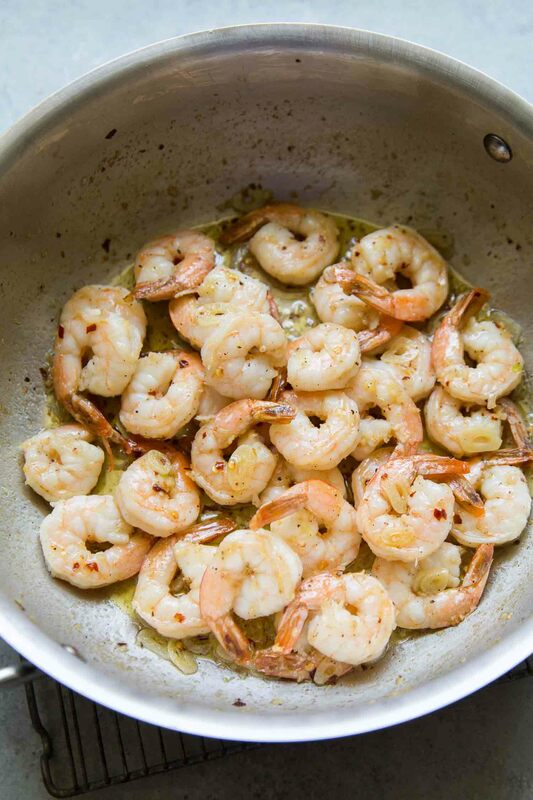 In a large bowl, toss together shrimp, salt, black pepper, sugar, and garlic powder. Set aside. Add oil and butter to a large saute pan or sauce pot. Cook over medium heat until butter has melted. Add red pepper flakes and cook for 20 seconds. Stir in garlic and cook for 30-45 seconds until fragrant. Add in seasoned shrimp. Cook for about 2 minutes on each side until shrimp is pink throughout. Remove from heat. Add cooked spaghetti, seasonings, and about 2 tablespoons of reserved pasta water. Toss together until pasta is well coated. Garnish with chopped parsley. Serve immediately. I used large shrimp listed as 26/30, shelled, deveined, with tails on. If desired, season with additional salt and pepper. For a brighter dish, feel free to add a squeeze of fresh lemon juice. Leftovers can be stored in an airtight container in the fridge up for up to 2 days. If using frozen shrimp: make sure to completely THAW the shrimp. 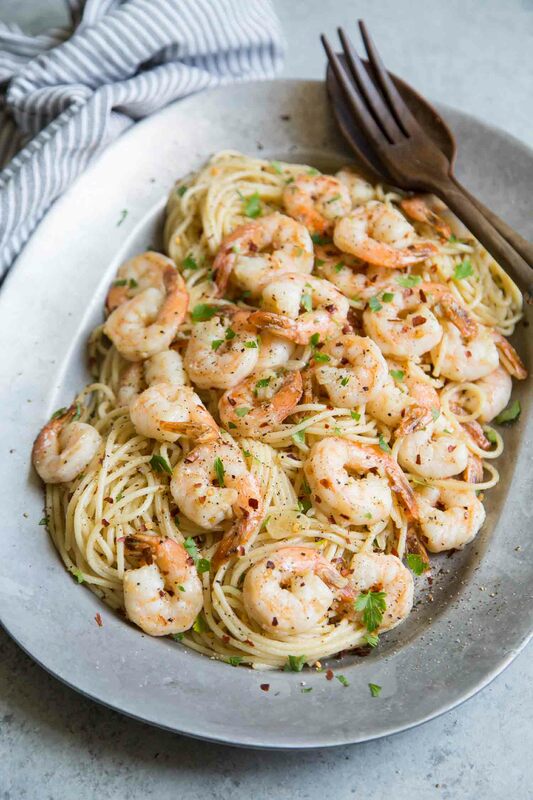 Thaw shrimp overnight in the fridge or place them in a colander in the sink and run cold water over shrimp for about 5 minutes.